Hallux valgus is defined by subluxation of the first metatarsophalangeal joint, which results in first metatarsal head medial prominence and lateral deviation of the proximal phalanx on the first metatarsal. 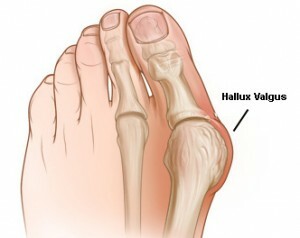 The Keller procedure is seldom indicated as a hallux valgus procedure. It is reserved for the older, less active patient; in a patient prone to skin problems; or in the case of an arthritic joint. This procedure is contraindicated in an active person because of its known complications. The procedure involves excision of the base of the proximal phalanx to decompress the metatarsophalangeal joint. Along with the procedure, the medial eminence is removed, and then the intrinsic muscle attachments are repaired to the remaining stump of bone. A Kirschner wire is drilled through the toe as a stabilizer until the toe heals and scar tissue forms, approximately 4–6 weeks. Postoperatively, the patient is permitted to ambulate in a postoperative shoe, and dressings are changed for 6 weeks.